"Find out more about the steps for divorce proceedings"
The procedure to dissolve a marriage are known as divorce proceedings and these are separate from ancillary relief proceedings that are concerned only with resolving the financial matters. It is not possible to start divorce proceedings if married for less than one year although nullity or judicial separation could apply in this case. Assuming the individual applying for a divorce in the UK does so after one year, can satisfy the conditions for residence and has grounds for a divorce then it is possible to start proceedings by completing a petition form and submitting this to any divorce county court or the Principal Registry in London. If the individual is not sure if they have grounds for divorce, their spouse will not agree to a divorce, there are children of the marriage or complex property and assets, then it may be necessary to seek professional advice from a family lawyer. During ancillary relief proceedings different orders can be applied to the matrimonial home by the court depending on the circumstances of the parties. The following provides extracts from the Family Proceedings Rules regulations which are produced by and subject to Crown Copyright and from the Court Service, showing the step-by-step process an individual must follow when making an application for divorce proceedings. For more information the Court Service website can be accessed from the official sites links page. There are a number of conditions that must be satisfied regarding an individuals residence, or their husband's or wife's residence before it is possible to apply for a divorce petition in England and Wales.  You must have your permanent home in England or Wales and have been living in either of these countries for at least six months on the day the divorce petition is started. Either spouse can apply for a divorce petition and this person is known as the petitioner. To do this Form D8 (divorce petition) and Form D8A (statement of arrangements for the children) if applicable, must be sent to the court together with the marriage certificate. The court fee for issuing the divorce is £150.  Separation without consent after five years. After a few days of the court receiving the petition, it will send the petitioner Form D9H (notice of issue of petition) confirming receipt of the petition and also when this was sent to the respondent. The court sends a copy of the petition and statement of arrangements to the other spouse, known as the respondent. If the respondent has instructed a family lawyer to act on his or her behalf, then these documents will be sent to them. Where the reason for the divorce is adultery, a copy of the petition must be sent to this person. This person is known as the co-respondent, however, their name does not have to appear on the petition. Within 8 days (including the day of receipt) of the petition and statement of arrangements from the court, the respondent must send to the court Form D10 (acknowledgement of service). The respondent must state on the form if he or she intends to defend the petition, if there are any claims for costs are disputed and if there is agreement between the parties regarding the arrangements for the children. If the respondent intends to defend the divorce, within 29 days (including the day of receipt) of the petition and statement of arrangements from the Court, he or she must send to the Court a defence known as an 'Answer'. A defended divorce leading to a final contested hearing is unusual as the majority of parties reach an agreement during divorce proceedings. A defended divorce leading to a final hearing is also very expensive and public and can be reported through the press. If you know the respondent intends to defend the case but does not respond within 29 days, you can apply for directions for trial. The petitioner must complete Form D84 (application for directions for trial) and Form D80 (affidavit of evidence) which are provided free from a court office. There are different versions of Form D80 for each of the five grounds for divorce. If the respondent or any co-respondent fails to return Form D10 (acknowledgement of service) to the court, then 8 days after the petition was sent the petitioner must get 2 copies from the court of Form D89 (request for bailiff service). With this form the petitioner must also send a photograph or a written description of the respondent or co-respondent together with a fee for each person being served.  that the respondent has agreed with the arrangements for the children. The petitioner must swear the affidavit before an officer of the county court or the Principal Registry or a solicitor and then send this together with the decree nisi to the court. Once the court receives the application for the degree nisi, a Judge will review the paperwork to ensure that it is in order. If this is so the court will send both the petitioner and the respondent Form D84A (certificate of entitlement to a decree) informing of the time and date the Judge will grant a decree nisi. If there are no children, Form D84B (notice of satisfaction with the arrangements for the children) will also be sent with Form D84A confirming that there are no children. When the decree nisi is granted, 6 weeks and 1 day later the petitioner can apply for the final decree called the decree absolute and submit Form D36 (notice of application for decree nisi to be made absolute) at a cost of £30. 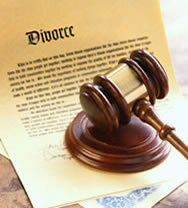 This is processed within a few days and the Court can then grant the decree absolute making the divorce final. The court will sent to the petitioner and respondent Form D37 (decree absolute). If the petitioner does not applied for a decree absolute, then the respondent can apply 3 months after the date the petitioner could have applied for the decree absolute. This is 4½ months and 1 day after the decree nisi is granted and the cost is £30. The petitioner can prevent the respondent from doing this if the petitioner can show that by doing so would create financial difficulties, where a final financial order for ancillary relief has not been granted.